Despite the global demand for soccer, many of the products remain geographically isolated. 2016 Topps Premier Club Soccer is a perfect example of this. Although the subjects are household names for many and the set is issued by Topps, the product is not all the accessible outside of Europe or Asia. 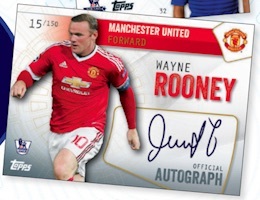 Each display box of the Premier League release promises three total hits. The Premier Club base set includes 150 cards. The first 140 cards are standard base options with a focus on the top players in the BPL during the 2015-16 season. The final ten cards are part of the Future Stars subset and highlight the key young players in the league. Collectors can also find a variety of rainbow foil insert sets. This includes Superstar (10 cards), Captain (20 cards) and Star Strikers (20 cards) cards. The remainder of the product centers around the the hits. Although specifics are not available, there are both Autographs and Memorabilia cards to chase and the group combines to average three per box or roughly 1:17 packs. Top preliminary names include Wayne Rooney and Dennis Bergkamp. Low end hits for the most part. Lots of doubles of hits. Doubles doubles doubles. And I bough a case. Just bought two little packets of 5 cards and was not that impressed. The quality is ok, better than the match attax cards but for �3.00 a packet or �150.00 a box I don’t think the amount of hits are very good. Over priced product. Is Topps ever going to produce a complete checklist for this collection?